Karl Szmolinsky, who raises a breed of rabbits called giant grays, shows Robert, an 8.5kg giant gray who is 74cm long and has ears 25.5cm long, in the backyard of his house in Eberswalde, Germany in 2006. Szmolinsky sold eight giant grays to a delegation from North Korea that wanted to raise the breed as a source of meat for the North Korean population. 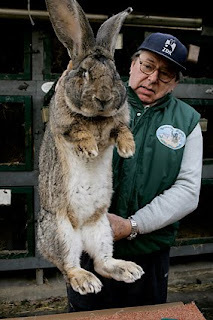 Szmolinsky said his rabbits reach a maximum weight of 10.5 kg (23.1lbs.). wow these giant rabbits are great! I hope to see one in person soon! giant rabbits! I would love to see these giant rabbits here in our country soon! Thank you very much for sharing these giant rabbits! I would love to see one soon here in our country! when will i be able to see these giant rabbits in person? I'm so excited to see one. thank you very much for sharing this giant rabbits post! keep up the good work.